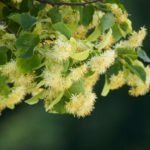 If you have a large landscape with plenty of room for a medium-to-large tree to spread its branches, consider growing a linden tree. These handsome trees have a loose canopy that produces dappled shade on the ground below, allowing in just enough sunlight for shade grasses and flowers to grow beneath the tree. Growing linden trees is easy because they require little care once established. Linden trees are attractive trees that are ideal for urban landscapes because they tolerate a wide range of adverse conditions, including pollution. One problem with the tree is that they attract insects. Aphids leave sticky sap on the leaves and cottony scale insects look like fuzzy growths on the twigs and stems. 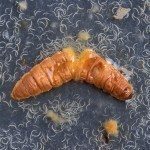 It’s hard to control these insects on a tall tree, but the damage is temporary and the tree gets a fresh start each spring. Little-leaf linden (Tilia cordata) is a medium to large shade tree with a symmetrical canopy that looks at home in formal or casual landscapes. It is easy to care for and needs little or no pruning. In summer it produces clusters of fragrant yellow flowers that attract bees. In late summer, dangling clusters of nutlets replace the flowers. American linden, also called basswood (T. americana), is best suited to large properties such as public parks because of its wide canopy. The leaves are coarse and not as attractive as those of the little-leaf linden. The fragrant flowers that bloom in early summer attract bees, which use the nectar to make a superior honey. 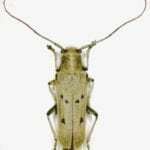 Unfortunately, a number of leaf-eating insects are also attracted to the tree and it is sometimes defoliated by the end of summer. The damage isn’t permanent and the leaves return the following spring. European linden (T. europaea) is a handsome, medium to large tree with a pyramid-shaped canopy. It can grow 70 feet tall or more. European lindens are easy to care for but they tend to sprout additional trunks that should be pruned off as they appear. 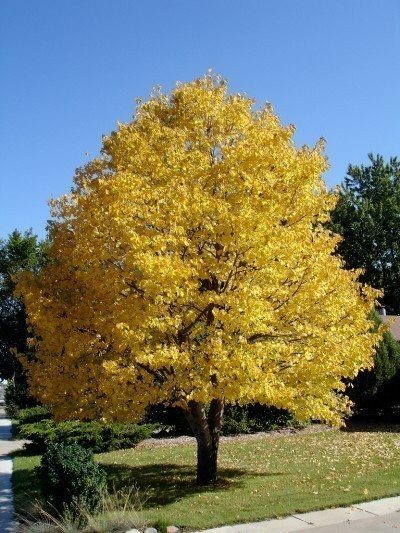 The best time for planting a linden tree is in fall after the leaves drop, although you can plant container-grown trees any time of year. Choose a location with full sun or partial shade and moist, well-drained soil. The tree prefers a neutral to alkaline pH but tolerates slightly acidic soils as well. Place the tree in the planting hole so that the soil line on the tree is even with the surrounding soil. As you backfill around the roots, press down with your foot from time to time to remove air pockets. Water thoroughly after planting and add more soil if a depression forms around the base of the tree. Mulch around the linden tree with organic mulch such as pine needles, bark or shredded leaves. Mulch suppresses weeds, helps the soil hold moisture and moderates temperature extremes. As the mulch breaks down, it adds essential nutrients to the soil. Use 3 to 4 inches of mulch, and pull it back a couple of inches from the trunk to prevent rot. Water newly planted trees once or twice a week for the first two or three months in the absence of rain. Keep the soil moist, but not soggy. Well-established linden trees only need watering during prolonged dry spells. Fertilize newly planted linden trees the following spring. Use a 2-inch layer of compost or a 1-inch layer of rotted manure over an area roughly twice the diameter of the canopy. If you prefer, you can used a balanced fertilizer such as 16-4-8 or 12-6-6. Established trees don’t need annual fertilization. Fertilize only when the tree isn’t growing well or the leaves are pale and small, following the package directions. Avoid using weed and feed products designed for lawns over the root zone of a linden tree. 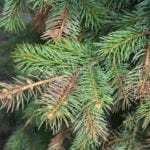 The tree is sensitive to herbicides and leaves may become brown or distorted.